Today was so disjointed for me. As I previously stated, my commute to work is an hour and a quarter to an our and a half. (In an area known for its 20 minute commutes, this is not the norm.) I work in a library that is co central with another library in the neighboring county (about an hour away in a different direction). There was a system meeting at that library this morning. So, I drove to my library in order to carpool to the other library. I started my day by being in a car for about 2 1/2 hours. At least we are having an unusually mild winter this year and there wasn’t any snow to deal with. The meeting today was with a book vendor who was show casing the cataloging and processing services they could provide for our system. It was interesting. Call me a skeptic, but the thought of someone offering “collection development help” when they are not involved with your patrons everyday or even part of the community makes me a little nervous. Right now it is just lists that suggest titles, but I feel that there is a potential there for nefarious and questionable practices there sometime in the future. (Kind of like Amazon finally making their Kindle compatible with Overdrive but then finding out that they track what their users have read when using the public library check outs.) No commitments or decisions were made, so we will see what the outcome is. When I got back to work, I grabbed a quick lunch at my desk while reading Library Journal. I remembered half way through lunch that today was February 1st – the beginning of Library Lovers Month. I have a box of bags to have the Circulation Desk hand out that state “I ❤ my Library”. I set out with a handful of bags and was reminded that even though I wasn’t “officially” on Reference today, your Reference duties never end when you are a librarian. 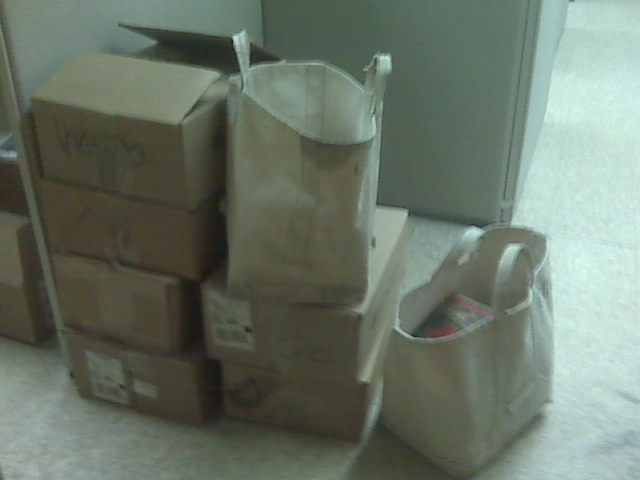 I was stopped about three times before I got to the Circulation Desk with the bags. The kids who were checking out books at the time when I brought the bags up were so excited to get a “special” library bag. Today I also had to get books ready for delivery tomorrow. Every Monday and Thursday a truck comes to pick up books that patrons have requested from other libraries and drop off books our patrons have requested or that are being returned from other libraries. The truck usually gets there before we officially open in the morning, so we have all the boxes and bags packed on Wednesday nights. We actually lend out a ton of material to other libraries. We have a new videoconferencing unit that was part of the grant I am in charge of. We haven’t been able to call out since they installed it in late December. We have opened every port, allowed it through the firewall, etc. Today the technician was suppose to come and check on it (finally! ), but we received an e-mail that he had come down with the flu and had to reschedule. (It took us weeks to get this appt. set up.) So, we will see how soon he can make it and hopefully we will be able to use our new equipment soon. One thing I can say for sure – working in a public library is never dull! Today is day two of Library Day In the Life Round 8. I started the day with a 3 1/2 hour Reference shift. Reference shifts are always interesting. My library is in the major city of the county and is surrounded by rural areas, a major university, a community college, and the state border. So the questions run the gamut from basic to very scholarly. In the history of Olean it was a place where people would over winter before heading out west on the Allegheny river. Also, it has a lot of oil history and there was mob activity during prohibition; it had the nickname of “Little Chicago” during that time. Therefore, local history is also the source of many Reference transactions. I am the director of our Public Computing Center. We run classes and tutoring sessions. We don’t have enough room to have a permanent teaching lab with the SMART board, so we have to set the lap up each time there is a class. Today’s class was Organizing E-mail. We have honed our skills that we can quickly set up and tear down the lab quickly. While on the Reference Desk I entered names into the Winter Reading database. Sign up for the program just started yesterday and we had 19 people signed up as of this morning. Anyone who turns in a completed Winter Reading BINGO board will receive a prize along with an invitation to the Winter Reading party. At that party we will have a drawing for a “Cozy Up and Read” basket. I decided I am going to crochet an infinity scarf to include in the basket. We are offering patrons a “Free” sticker for one space on the BINGO board if they fill out a short survey on the library. The survey has questions about various services in the library and should give us some good feedback. 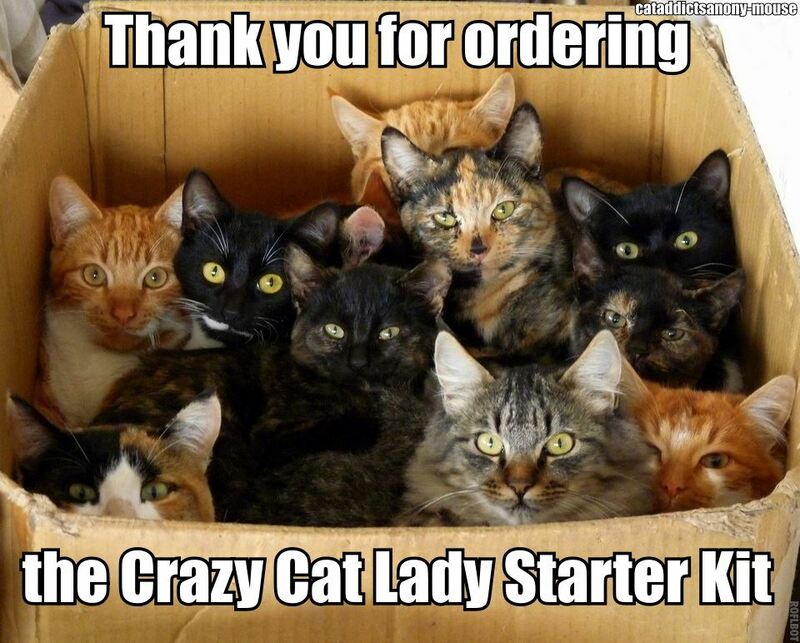 You never know what e-mail is going to bring when you are a librarian. Today I received an e-mail that stated that I needed to make my reservations at the hotel in Geneva for a conference I have to go to at the end of April. I start to call the number while I continue to read and there it is… “you will need to make a presentation to the NTIA (National Telecommunications and Information Administration) program officer and be an available to answer any questions they may have.” INSTANT HEADACHE. I felt kind of ambushed. I know, I have a few months to prepare it, but it still stresses me out. Another job duty that I inherited is the Brown Bag Book Club. We meet every 3rd Tuesday of the month to discuss a book. I had the book list made up from Jan-June. People have been asking for the July – Dec. list. I read all the books before I put them on the list, so I was still trying to make decisions on what books I wanted to include. Finally today, after many inquiries, I decided to just bite the bullet and make the list. Right before I left, I made a quick visual tutorial for downloading eBooks to the Kindle. The Kindle is different from other eReaders and confusion seems to abound. Hopefully this will make everything clearer. My director and asst. director convinced me to go to a meeting with them tomorrow morning at System headquarters. So, I will drive from my house to Olean (about a 1 1/4 – 1 1/2 hour commute) to then get in a car and travel another hour or so to Jamestown, go to a meeting, and then travel another hour or so back to Olean. Should be an interesting day. Wednesdays are my late days. My reference shift is 6-9pm and I have to lock up the library. It is nice because I don’t have to get up at 6:15am, but odd in the fact that I get home after 10pm and eat dinner then (or a form of dinner). When I got to work today, I was met by another huge pile of holds. This week has been crazy with holds. Here is a picture of the holds going out tomorrow. This has just been since Monday afternoon – 6 boxes and 2 bags of materials to be sent out tomorrow morning. It is certainly going to help ou circulation stats! After doing my daily ritual of checking the social media sites and updating them, I started to review the Library Journal that was sitting in my mailbox. There was an interesting article on the use of Google Wave in libraries. I have Google Wave and think there are a lot of potential uses for this including e-mail/IM reference. One of the best hints the article gave was a search string to find public waves dealing with libraries. In the search box type (without the “” marks): “with:public title:library | title:libraries”. I also ordered some books in that were listed in publication. I just took over the Biography collection and I ordered quite a few biographies. I also received some extra money this year to update our medical section and I ordered some new books for that section also. Here is a picture of some of the brochures that I make (including The Lost Symbol one that I finished yesterday). Today was also National Chocolate Cake day. I made sure that all our Facebook and Twitter followers knew that. I usually share any interesting holidays and facts with our followers as well as a word of the day. Patrons seem to enjoy the word of the day quite a bit. Well, I have to start again tomorrow at 9am, which means I have to get up at 6:15am. My reference shift tomorrow is from 9-12:30pm and I have to receive the delivery, so I will have a busy morning. I better get to bed! Let me start this post by saying I blame Jame Patterson for my poor performance on the Jeopardy online test tonight. There was a question on I, Alex Cross which is a popular book right now. I could picture the cover of the book but not the author. The Jeopardy test is 50 questions long and around question 45 I remembered James Patterson, but not only was it too late to answer the question – the fact that I was frustrated about that screwed up my concentration for the rest of the test. On the way to work this morning I finished The Lost Symbol. I have to say it was not my favorite Dan Brown novel and I felt it was bit too long; however it does have the potential to spark people’s interest in some topics that maybe they have never thought about. The first thing I did this morning was work on holds that were pulled last night. Our hold shelf is getting full and we just sent out a shipment on Monday. School is back and session and it is cold outside – I guess books are popular this week! After holds I went back to my computer and updated our Facebook page and our Twitter page. I also did my morning search of Twitter to see if anything had been said about the library. 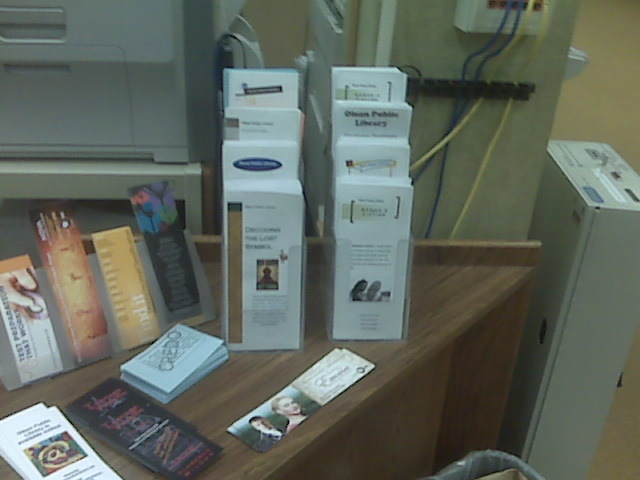 I printed our the Wireless Access Policy Brochures I made yesterday and put them on display at the Reference Desk. When I came back to my office there was a pile of material on my desk just waiting for me. The pile on my desk represents the diversity of a public librarian’s life. 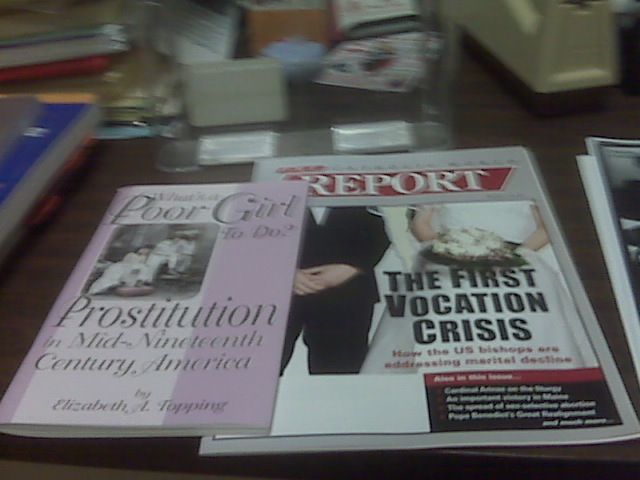 There is a book on 19th C. prostitution sitting next to “The Catholic Wold Report” on my desk. After I went through the pile and made it more manageable, I decided to go on to my e-mail. 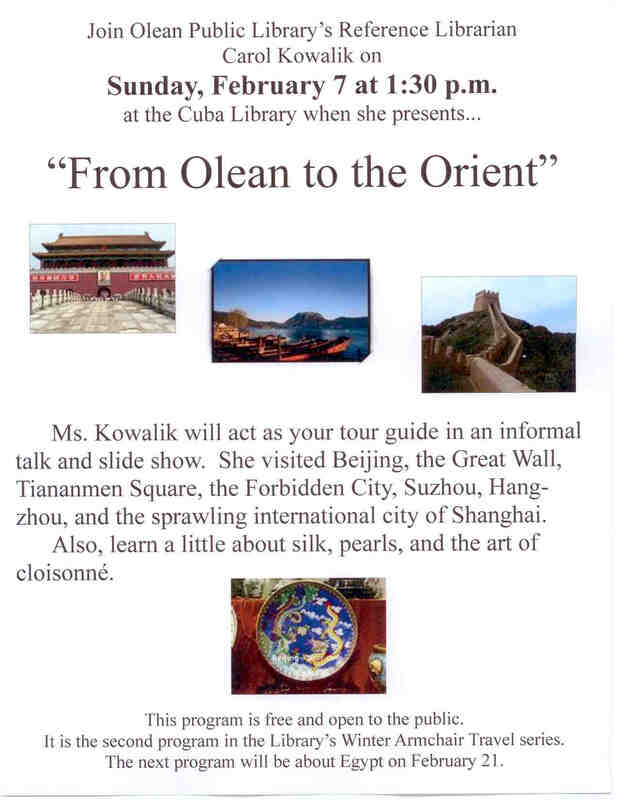 In my e-mail was a message from the director of a library in a neighboring town. I am doing a presentation there on February 7th and she wanted to confirm some details with me and finalize her press release. I then updated our library blog. A neighboring county is going to host a traveling exhibit of replica artifacts from the Abraham Lincoln Presidential Library and Museum. Only 40 places throughout the US are going to host this exhibit and this town happens to be one of the lucky few! We are looking at new a new Checkpoint system and today I went over some quotes for the different systems . I was running in to some problems trying to find the exact subjects I wanted using our Sirsi system, so I decided to go into the 200s and look for books that would fit into my reading list for The Lost Symbol. I found exactly what I was looking for and some books I want to read just for myself! I finished the reading list brochure this afternoon and left around 5:02pm. On a side note, our Big Read materials came in. 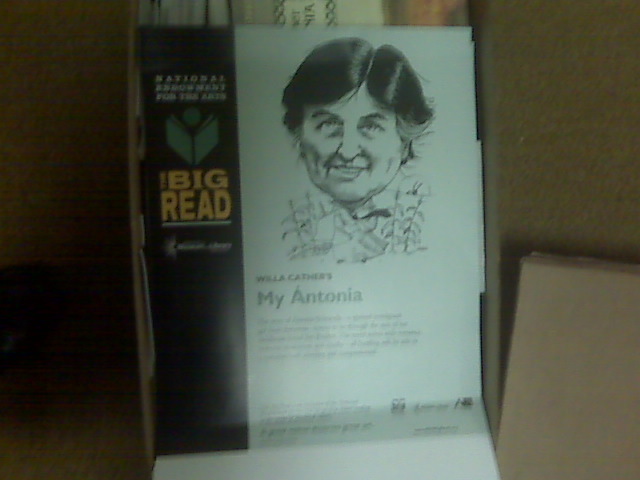 This year we are doing My Antonia by Willa Cather. This is my first year participating in Library Day in the Life. I got to work at about 9:45am. On Mondays my shift on the Reference Desk was from 3-6, so I start at 10. When I walked in the door, I was greeted by books from the delivery. Our library is co central in our system. The truck comes on Mondays and Thursdays. We send out boxes of books/dvds/audio books/CDs to other libraries in the system and we receive ones that our patrons have requested from other libraries in and out of our system. I have to check the books in before the patrons are called to tell them they are in our library. 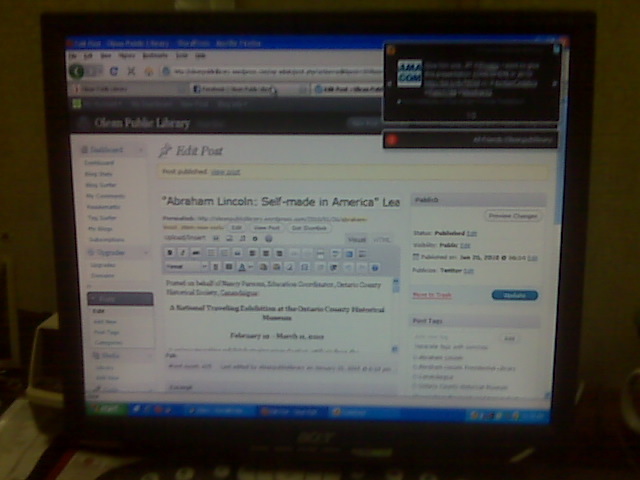 After I was finished with that, I updated the library’s Facebook and Twitter accounts. I also did a quick search on Twitter to see if there have been any mentions about the library. I am the head of the Tech Committee and we have been working on a new Wireless Access Policy. The policy was approved by the Board of Directors last week and I am now working on brochures that we can hand out to those using our wireless network. Trying to make a policy brochure look appealing to the eye is easier than it sounds. After that I went to lunch. On lunch I tend to either read novels or articles. Today I read an article on Windows 7. I have offered classes in the past and I want to offer more this year on different computer topics. I do not have Windows 7 and I am trying to see how different this new OS is from XP and Vista. I have several computers at home (I am a techie geek) with XP, Vista, OSX (Snow Leopard), and Linux. I do not have Windows 7 yet and I haven’t been able to play with it, other than at Best Buy while shooing salesmen away ;-). I have a long commute to work (1 hour and 15 mins). I use this time to keep up with fiction by listening to audio books. I am almost finished with The Lost Symbol by Dan Brown. I create read a likes and pathfinders for the library. My latest idea was to create a list of non fiction resources we have that would pertain to what goes on in The Lost Symbol. When I came back from work, I started to work on that. I found books on Freemasonry, Rosacrucians, secret societies, and symbology. I put the list aside at about 2:30pm to go work on holds for about a 1/2 hour before I went on the Reference Desk. I ended the day by reading an article on the uses of foursquare with the library and I updated the library’s information on Foursquare. I left work at about 6:20pm. Tomorrow at 9am it all starts again!